The steady decline of lucrative sea urchin landings since 1993 initiated concern among both fishermen and managers. In response, and at the request of sea urchin industry leaders, the Maine legislation created the Sea Urchin Research Fund (SURF) in 1995 to study the continued decline of the fishery.4 The research produced proved valuable for understanding the dynamic ecological relationships among the interacting species in Maine’s kelp forest ecosystems. Although Maine has established a variety of regulations since 1992, they have not successfully halted or reversed the decline of green sea urchin populations.5 Following the sea urchin decline, a crab fishery soon became a new target for fishermen. However, even the removal of crab predators by this fishery has not reduced crab populations enough to restore urchins.6 Additional steps by the Department of Marine Resources advisory board include splitting the fishery into two management zones, setting limits to the number of sea urchin harvesters, and applying minimum and maximum size limits on harvest urchins.4 Managers have also been working with scientists to use monitoring data collected over the past few decades to create mathematical models of the ecological system and offer insight into more effective future management plans. The sudden rise in the demand and value of urchin roe in the late 1980s commenced widespread overharvesting and mismanagement of the green sea urchin fishery in Maine. Unfortunately, by the time fisherman and managers observed the decline in urchin populations, it was too late as population levels had already crossed an ecological “tipping point.” Now, the ecosystem remains in a kelp-dominated state and the once dynamic system that supported patchy habitats by grazing green sea urchins is no longer sustainable. The loss of green sea urchins in Maine impacted many people’s livelihoods and continues to hinder future economic prospects for the fishery. The story of the Maine sea urchin fishery emphasizes the need for ecosystem-based management and increased recognition about interactions between species. The immense overharvesting of green sea urchins indirectly initiated a cascading effect that reinforced and locked the system into an alternative ecosystem with fundamentally different ecosystem services. Furthermore, the Gulf of Maine’s coastal ecosystem evolved under strong top-down control by predatory finfish, and the rise in crabs as apex predators was only possible because of earlier fisheries–induced declines in their finfish predators.1 While the rise in crabs and lobsters have become new targets for fisheries in Maine, this information taken together still signifies the need to incorporate multi-species and ecosystem-based management into management plans if any fisheries are going to be successful in the long-term future. 1Steneck, R.S., Leland, A., McNaught, D.C., and J. Vavrinec. 2013. 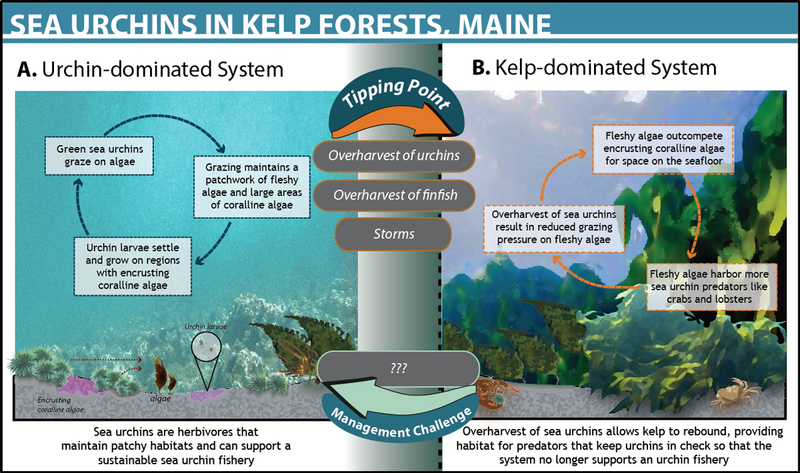 Ecosystem flips, locks, and feedbacks: the lasting effects of fisheries on Maine’s kelp forest ecosystem. Bulletin of Marine Science 89. 2Wilen, J.E., Wessells, C.R. 1997. An Economic Analysis of the Market for Maine Sea Urchins. State of Maine Department of Marine Resources. 3Kanaiwa, M., Chen, Y., and M. Hunter. 2005. Assessing a stock assessment framework for the green sea urchin Stronglocentrotus drobachiensis fishery in Maine, USA. Fisheries Research 74(96-115). 4Taylor, P.H. 2004. Green gold: scientific findings for management of Maine’s sea urchin fishery. State of Maine Department of Marine Resources, Boothbay Harbor, Maine. 5Vavrinec J. 2003. Resilience of green sea urchin (Strongylocentrotus droebachiensis) populations following fishing mortality: marine protected area, alternative stable states, and larval ecology.